At six foot five, Paul Dekker was a big target for Quarterbacks with big sure hands, though he was also noted for his outstanding blocking ability as an offensive end. Dekker played college football at Michigan State, and then spent 1953 in the NFL with the Washington Redskins. 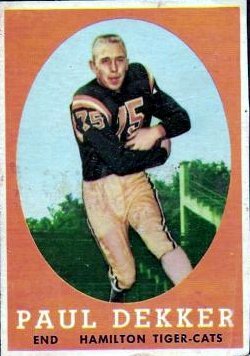 Dekker joined the Hamilton Tiger-Cats in 1956, and played seven seasons with the Tabbies, picking up four East All-Stars at offensive end (1958, 1959, 1960 and 1961). There were no CFL All-Stars until 1962. Dekker finished third in the East in receving twice, with 38 catches for 638 yards in 1958 and again 1961 with 37 catches for 578 yards. Dekker's best year, however, was 1960 with 50 catches for 790 yards. All of these numbers were done in 14 game seasons.